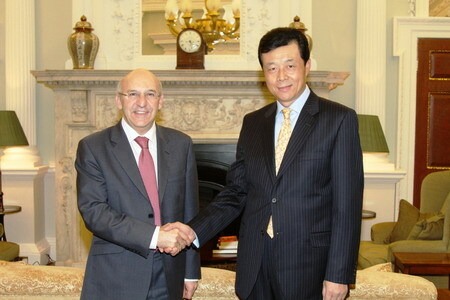 On December 10, Ambassador Liu Xiaoming called on Alderman Michael Bear, the new Lord Mayor of the City of London. Ambassador Liu congratulated Alderman Bear on his appointment as the Lord Mayor of the City of London and said that at present China-UK relations are in a good shape, with fruitful financial cooperation as an important component. The Bank of China, the Industrial and Commercial Bank of China, the Construction Bank of China and the China Merchants Bank have all set up their branches in London and are doing quite well there. Ambassador Liu expressed hope that the British side will continue to facilitate and support the investment of Chinese corporations in the UK. Alderman Bear said that the British side welcomes more financial institutions from China to UK and that the City of London is ready to provide good services for Chinese companies. He himself looks forward to a visit to Beijing, Shanghai, Guangzhou and other cities in China as head of a delegation in the first half of next year and hopes the visit will help further promote the financial cooperation between the two countries. Ambassador Liu wished Mr. Bear a successful visit to China.